My snowmen even got to play in some real snow, as we had a huge dump of magical, beautiful flakes. Ok, don't laugh when I tell you that these didn't start out as snowmen. I had planned to make little decorated Christmas trees, but when it came to the decorating bit, I discovered that most of the 'trees' had been eaten by a certain someone. The few remaining ones ended up as snowmen as I had lost the enthusiasm to decorate. My husband doesn't eat marshmallows so I made up this recipe without them, it does make the krispie treats a bit more solid though! Decorate - easy, compared to the melted snowmen cupcakes I made last year! 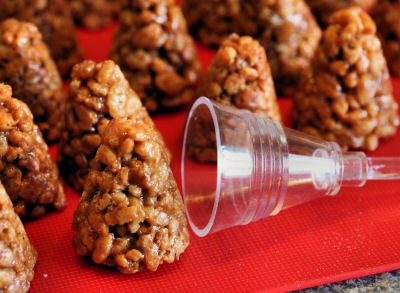 Chocolate Caramel Krispies - Snowmen, Trees or Squares. You can use your favourite rice krispies recipe, which will make for softer treats, or use my recipe which does not use marshmallows. This recipe makes a lot of little cone shapes, I got a bit bored half way through and dumped the rest of the mixture into a tin and made some squares. If the mixture starts to set hard and you haven't used it all up, you can put it into a microwavable bowl and heat for a few seconds to make it pliable again. 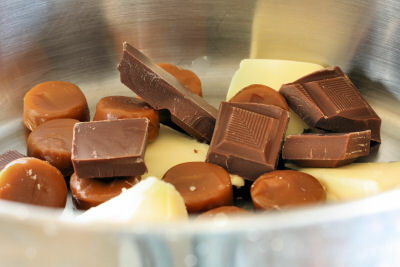 In a very large saucepan, gently heat the butter, toffees and chocolate together until melted. 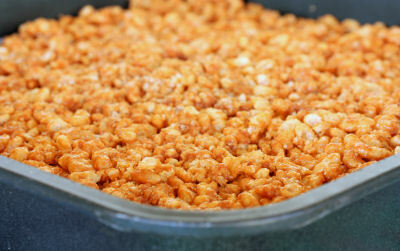 Add the rice krispies and stir until they are all coated in the caramel mixture. 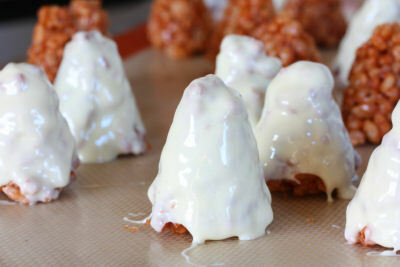 Working quickly, form little cones by spooning small amounts into a coconut pyramid shaper, leave to set on baking parchment or a silicone sheet. 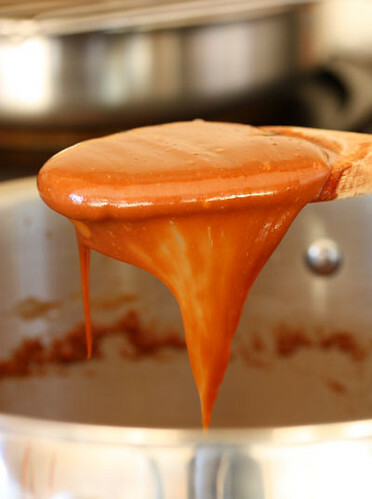 If you don't have a cone shaper, you can form them in your hands but be careful as the toffee mixture can be very hot. You can also spoon the mixture into a tin lined with baking parchment, smooth down with the back of a spoon, leave to set and cut into squares. Melt the white chocolate and dip the cones in, leave to harden. Using the black icing tube, dot on the eyes and buttons. Make little noses out of the orange fondant and stick them on with a bit of white icing from a tube. Stick on dried cranberries for the hats and sprinkle with edible glitter. These snowmen krispies are headed over to Food Blogga's Eat Christmas Cookies, being hosted by Susan. Don't forget that the page is being updated as the entries come in, so have a look! Ho ho ho...what a load of fun Nic. I love how creative you got with these guys! Tch tch...now who would eat the trees without asking??? BTW, thanks for the beautiful card. These are maybe the cutest things i've ever seen! What a great holiday present! I can't wait to make them, such a creative idea! Nic you are just too tricky! They are amazing - I love them! We only got a teeny bit of snow - can you send some here please?! The snow in the West of Scotland has been blustery, that is to say it has not settled yet, but it may by the morning when I hope to go over to the allotment to check on my sprouts. 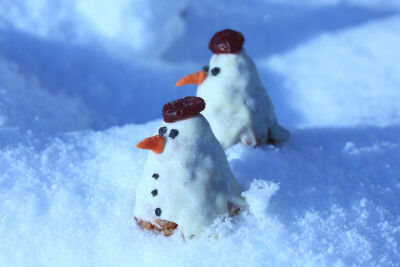 These snowmen are looking so cute & ooh so tasty too!! Just lovely & very creative!! Looks wonderful - a real winter wonder land! I think these are such a fantastic Christmas treat. I know my Cookery Kids would love making these. 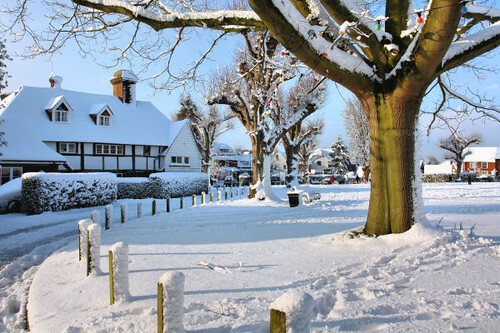 Your village looks stunning in the snow. Nic, tghose are the cutest snowmen ever! And yes, we've had our fair share of snow too! I can't stop saying, "OMG! These are most adorable cookies!" "Look at their tiny carrot noses!" "Ah! I love their hats!" As you can tell, I'm smitten. 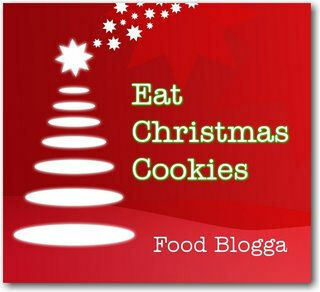 Your cookies are just gorgeous! The snowmen are soooo cute and they got to play in real snow. You have had more snow that I have here, your village looks like a Christmas card! Where do you live?! We didn't have THAT much snow in London. These cookies looks so cute and they're actually not that difficult to make, plus they're already gluten free! Yeaaaaah! Mmm my grandchildren would love to eat these! 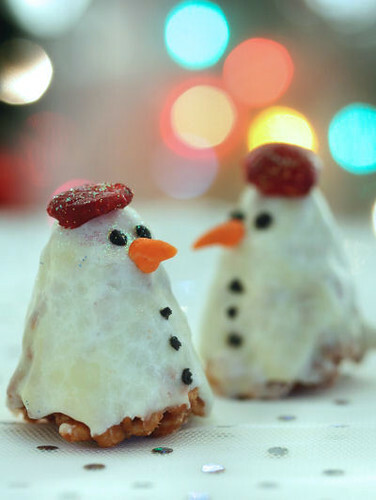 These are fun and I love your melted snowman cupcakes from last year too. I find things 'vanish' too if left out! Love the little snowmen, had not seen a cone shaper before! You have a way with snowmen! These are super-cute and your photos are gorgeous. Very fun idea. I saw these on tastespotting yesterday, but didn't notice that it was you who had posted them. What a great idea! Merry Christmas, Nic! Oh how nice, they got to play in the snow, hehe. I am not really a fan of krispie treats, but these are so cute I'd eat them all, LOL. Oh that's too adorable!! If only I had read this earlier I would have asked Santa for a coconut pyramid shaper ;-) Your village also looks gorgeous - far more pristine than London...! Wish you and your loved ones Happy Holidays and fab year ahead! It looks just like that in the village here in North Yorkshire where I'm bedded in for the festive season. Have a great Christmas and New Year. Best regards.